Samsung Electronics announced on Wednesday that it has begun mass producing the industry’s first one-terabyte (TB) embedded Universal Flash Storage (eUFS) 2.1 to power 5G features of artificial intelligence applications and augmented reality on mobile devices. 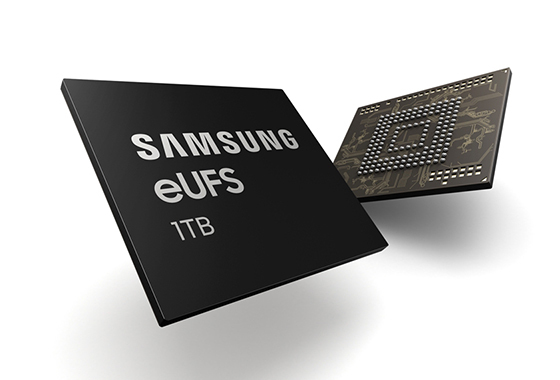 Samsung introduced the first UFS solution, the 128-gigabyte (GB) eUFS in smartphone storage capacity, in January 2015 and released the 512GB eUFS 2.1 in November 2017 and successfully the capacity of the previous version in about a year. Within the same package size, the 1TB eUFS solution doubles the capacity by combining 16 stacked layers of Samsung’s most advanced 512-gigabit (Gb) V-NAND flash memory and a newly developed proprietary controller. The 1TB eUFS also possesses exceptional speed, allowing users to transfer large amounts of multimedia content in significantly reduced time. At up to 1,000 megabytes per second (MB/s), the new eUFS features approximately twice the sequential read speed of a typical 2.5-inch SATA solid state drive (SSD). Furthermore, the random read speed has increased by up to 38 percent over the 512GB version, Samsung said in a statement. Samsung Electronics said it plans to expand the production of its fifth-generation 512Gb V-NAND at its Pyeongtaek plant in Korea throughout the first half of 2019 to fully address the anticipated strong demand for the 1TB eUFS from mobile device manufacturers around the world.